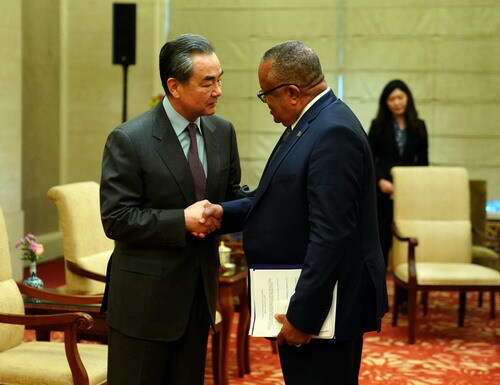 On February 21, 2019, State Councilor and Foreign Minister Wang Yi met in Beijing with Minister of Foreign Affairs and Foreign Trade Jerome Walcott of Barbados, who was in China for the seventh round of consultations between the Ministry of Foreign Affairs of China and the Ministries of Foreign Affairs of the Caribbean countries having diplomatic relations with China. Wang Yi expressed that the Barbadian side has always pursued a friendly policy toward China, and you will sign cooperation documents on jointly building the Belt and Road Initiative with the Chinese side during your visit. It will not only add new connotations to bilateral friendly relations, but also open up new prospects for mutually beneficial cooperation between the two countries. Wang Yi welcomed the Barbadian side to dispatch representatives to attend the second Belt and Road Forum for International Cooperation in China. Jerome Walcott said that the Barbadian side attaches great importance to developing its relations with China, and welcomes and supports the Belt and Road Initiative featuring foresight and mutual benefit and win-win results. The Barbadian side expects to continue strengthening cooperation with China and carrying out connectivity cooperation in such aspects as sea transportation, shipping and infrastructure under the framework of the Belt and Road Initiative. Both sides expressed that they should adhere to the principle of non-interference in other countries' internal affairs, and hoped that the Venezuelan issue would be solved peacefully through dialogue and consultation.